No need to throw out your empty shampoo bottles! Help preserve the economy and give your kids a fun activity to keep themselves busy with at the same time! This fun activity is great for boys and girls ages 6 to 11. Besides inspiring creativity and imagination, this project won't need to make its way to the trash! It becomes a great holder for pencils and markers and will help keep your supplies well-organized. With an adult's help, take your empty shampoo bottle and cut out a top design for your monster holder. You can do a squiggle cut, a zig zag cut, or a rounded cut. Get creative! First use the razor to cut through the bottle. If you need to use a scissor to help cut the top quarter off the bottle, then please do so because it might be a bit easier! Then using the top quarter of the bottle that was just cut off, draw 2 monster hands with a marker and cut them out. Now you are ready to make facial expressions. Draw awesome monster eyes, mouths, and teeth on your paper. Try different size eyes and creepy pointed teeth. 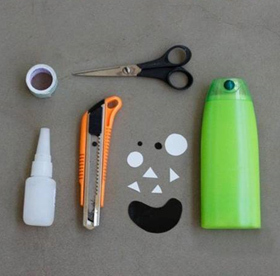 Cut them out and paste them on the bottom 3/4 part of your bottle which will become your pencil holder. (Optional: See yellow monster holder below) For an alternative mouth, you can cut a circle towards the bottom of the holder. Then stick some teeth in and you'll be able to see your pencils through the monster "mouth!" You are almost done! 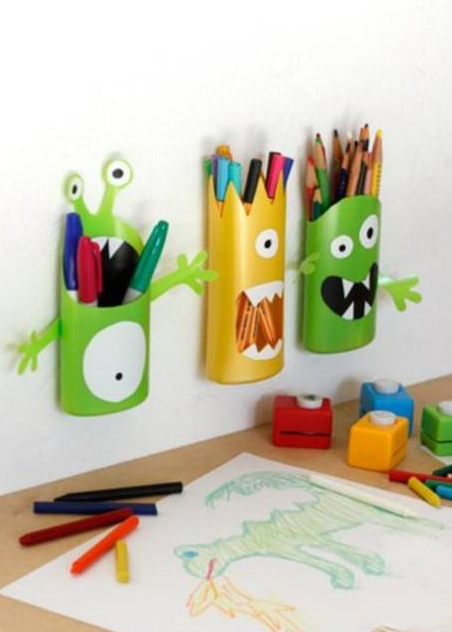 Now you want your monster holders to stick to the wall. Stick a piece of velcro to the back of the pencil holder. Then stick the other side of the velcro to the spot on the wall where you would like it to hang. Your monster holder is complete! Now start again from #1 and let your monster be joined by a different monster friend! Don't forget to fill them with pencils and markers!